On April 25th, The Staten Island Economic Development Corporation (SIEDC), a 501(c) 3 organization, will be holding its 14th Annual Economic Conference. Thousands of business people and vendors will attend, and come together for the SIEDC’s largest business event, which is being held at The Hilton Garden Inn from 8:00 am to 8:00 pm. The Staten Island Economic Conference will feature all day vending, along with educational seminars, keynote panels, mixers, and award ceremonies. 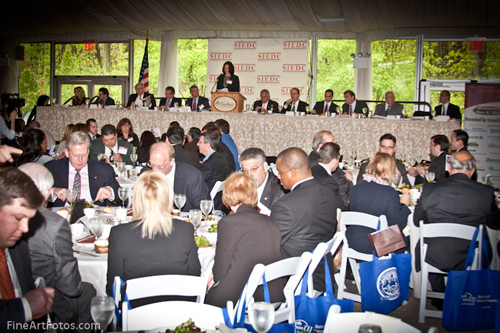 These award ceremonies include the 20 Under 40 Recognition Awards, and The Best Companies to Work for on Staten Island Awards. The 20 Under 40 Recognition Awards honors young leaders whose actions have made an impact on their community; and The Best Companies to Work for on Staten Island awards celebrates local businesses and their achievements. This event is free and open to the general public, while the keynote meal sessions are the only ticketed and paid portion of the event. This year’s economic conference is being presented by Northfield Bank. Chairman, President, and CEO of Northfield Bank, John Alexander, has stated that he supports the SI Economic Conference undoubtedly. He also said that he highly recommends anyone with, or without a business to attend this year for the simple fact that the event is full of useful information, as well as great opportunities for all. Anthony Ferreri, President and CEO of Staten Island University Hospital, the host sponsor, also says that the SI Economic Conference is an event that everyone should attend. Giving the people of Staten Island an opportunity to network, attend seminars, and listen to keynote speakers; this is the perfect event for someone looking to promote or start business on Staten Island. The launch of SIEDC’s Community Service Employment Program – for anyone looking for a job or looking to hire. Attend the presentation 9:30 – 10:30am in the Tea House Garden and find out how SIEDC and program partners can help you!